We asked people about their use of 14 different kinds of sources to get local news and their frequency of using those platforms. 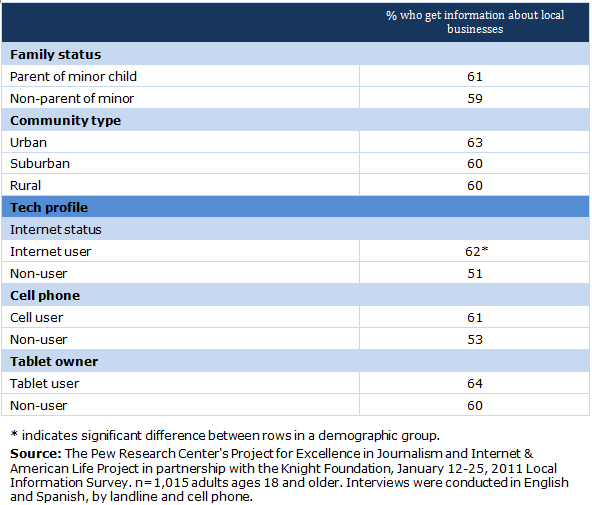 Some 72% of those who used at least six platforms monthly got news and information about local businesses, compared with 39% of those who relied on just one or two sources. 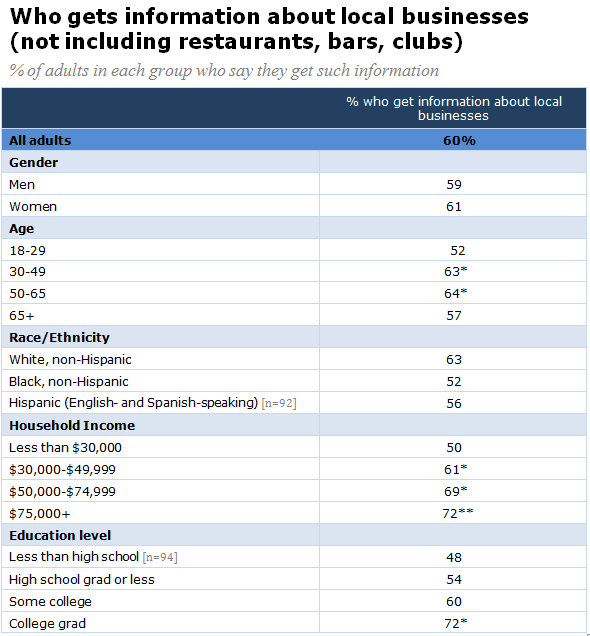 Additionally, we asked people if they got local news and information their cell phones and 47% of all adults said they did. Internet: 47% say some kind of online source is the one they most rely upon. 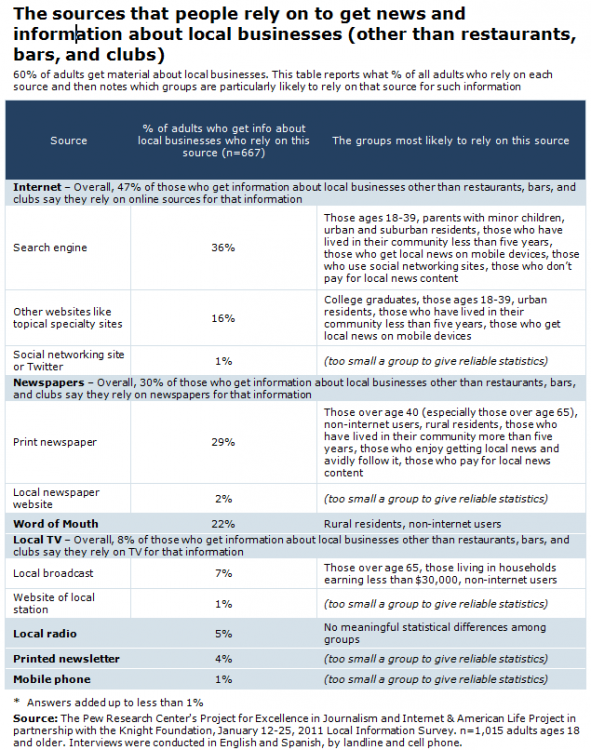 When it comes to getting information about local businesses, some 11% of the respondents who get this kind of information cited other sources beyond the main categories that we used. These answers were not specifically recorded, but might have included such things as advertising messaging via such things as billboards, signs, or phone directories; salesclerk or stranger recommendations; observations of foot traffic to stores; and general awareness of brands or merchants that didn’t arise from any particular information source. The list of sources was: 1) print version of local newspaper; 2) website of local newspaper; 3) local TV broadcasts; 4) website of local TV station; 5) local radio; 6) website of local radio station; 7) other websites that are dedicated to their communities; 8) blogs about their community; 9) people and organizations that respondents follow on social networking sites; 10) people and organizations that respondents follow on Twitter; 11) email newsletters and listservs; 12) printed newsletters; 13) word of mouth from friends; 14) search engines. We asked this as an open-ended question allowing respondents to declare whatever sources they felt they relied upon most. We created these categories for their answers and everything else was coded as an "other" source: 1) local print newspaper; 2) local newspaper website; 3) local TV news broadcast; 4) local TV station website; 5) radio (AM/FM or satellite); 6) local government website; 7) other website (not a print or TV news organization site or government site, includes national sites that offer local information, such as weather.com, craigslist, or patch.com); 8) internet search engine/search portal; 9) social networking site (such as Facebook or MySpace) or Twitter; 10) mobile phone "app"; 11) mobile phone email or text alert; 12) mobile phone: non-specific (includes search internet on phone); 13) call local government office; 14) word of mouth/friends and family; 15) print news bulletin/newsletter.